Are you planning to bring your four-legged best friend along for the trip to St. Augustine? We’re a dog-loving community. 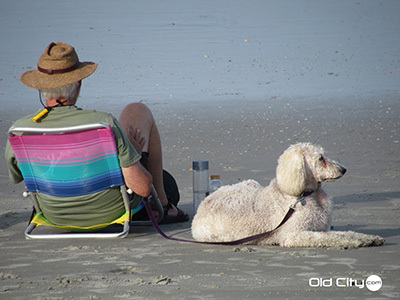 The Nation’s Oldest City is a great spot for pet hangouts from the beaches to the outdoor cafes downtown, just be sure to adhere to the leash laws and keep your pet on a leash at all times. Your first clue that St. Augustine has gone to the dogs? It’s not watching them frolic on the wide white sand beaches. It’s not the plentiful pet friendly places to stay and restaurants. The tipping point is the Tour de Chocolate. On this tasting tour through time, you learn that the first ship bearing chocolate to the New World docked in St. Augustine. You also discover that—contrary to popular opinion—dogs and chocolate aren’t mutually exclusive. While dogs don’t sample the sweets, “Travelers can bring their fourlegged family members on any of our tours,” says Isabelle Miranda, coordinator for City Walks Tour St. Augustine. They have nine pet-friendly rooms and they charge $20.00 per night per pet. Well behaved pets on leashes are welcome aboard! Pets are allowed on the grounds and in the exhibits, but watch out for peacocks!? From St. George Street to the Mission de Nombre de Dios, much of historic downtown St. Augustine is an outdoor adventure where pets (on leashes) are welcome! You will need proper shot records in order to take advantage of the day care.